Staff Sgt. 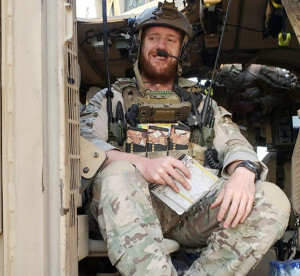 Dylan Elchin, a Special Tactics combat controller with the 26th Special Tactics Squadron, was killed when his vehicle hit an improvised explosive device in Ghazni Province, Afghanistan, Nov. 27, 2018. A special tactics U.S. Air Force airman was killed when his vehicle hit an improvised explosive device in Ghazni Province, Afghanistan, Nov. 27, 2018. Staff Sgt. Dylan Elchin, 25, a special tactics combat controller with the 26th Special Tactics Squadron, was deployed in support of Operation Freedom’s Sentinel. Shortly after graduating Hopewell High School in Pennsylvania, Elchin enlisted in the U.S. Air Force as a special tactics combat controller on Aug. 7, 2012. He immediately entered the two-year combat control training program and upon completion of the pipeline, he was assigned to the 26th STS at Cannon Air Force Base, N.M.
Elchin was a qualified military static line jumper, free fall jumper, an Air Force qualified combat scuba diver, and a qualified joint terminal attack controller. His awards and decorations include the Bronze Star Medal, Purple Heart, Army Commendation Medal with Valor, Air Force Commendation Medal, Air Force Combat Action Medal, Air Force Good Conduct Medal, National Defense Service Medal, Afghan Campaign Medal, Global War on Terrorism Service Medal, Air Force Longevity Service Award, Air Force Noncommissioned Officer Professional Military Education Graduate Ribbon, Air Force Training Ribbon and NATO Medal.